If you search for popular books on Amazon, it turns out you'll turn up intentionally misleading knockoffs. Publishers obviously aren't happy about about it, but some of these titles are hilarious. I Am The Girl With The Dragon Tattoo, anybody? Seriously, who falls for that? Apparently, a lot of people. Fortune found a slew of these ripoffs on Amazon. Currently, the online retailer's bestselling book Fifty Shades of Grey by E.L. James. If you'd been searching for the popular romance novel would you have been fooled by the very similar Thirty-Five Shades of Grey by J.D. Lyte? Maybe, actually! It's perhaps more shocking that Amazon (AMZN) not only sells the books, it's also helping their authors create them. All of the apparent copycat books that Fortune found on Amazon were made through CreateSpace, which is a division of Amazon. Authors can use CreateSpace's system to design and self-publish their own books. The books then go on sale on Amazon and other sites. 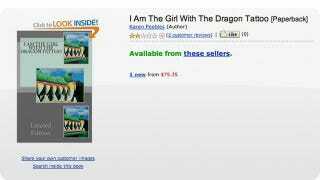 Amazon splits the proceeds with authors. It's a different relationship than most publishers have with their authors, but there is no way for consumers to know that. On Amazon and other sites, CreateSpace is listed as the publisher of the books. Unfortunately some of the best knockoffs are no longer available as far as we can tell. According to Fortune, Steve Jobs by Isaac Worthington was tearing up the charts on Amazon at one point, but we haven't been able to find it.